Ashes from the grave of John the Apostle, one of the Twelve Apostles of Jesus Christ, have been discovered in a lead tube reliquary by Bulgarian archaeologists during excavations of the ancient and medieval port of Burgos (also known as Poros) on Cape Foros in today’s Black Sea city of Burgas. The discovery of the lead tube containing ashes from the grave of John the Apostle, who is known as St. John the Theologian in Bulgarian (Eastern) Orthodox Christianity, located in the ancient city of Ephesus in Anatolia, today’s Turkey, has been made during the 2014 excavations of the fortress of Burgos (or Poros) on Cape Foros in Burgas but was announced only on Wednesday, March 25, 2015, by Milen Nikolov, Director of the Burgas Regional Museum of History, at a special press conference. He has also announced other intriguing finds such as the discovery of a Late Antiquity latrine, also found at Burgos (Poros), and the discovery of a 10th century Bulgarian royal seal from the Rusocastro Fortress. The structures at the ancient and medieval fortress and port of Burgos (Poros) which were excavated in 2014 include an Early Christian basilica from the 6th century AD, a building complex from the 5th-6th century AD, and a Roman villa from the 3rd century AD. The John the Apostle reliquary was found in the 6th century basilica. 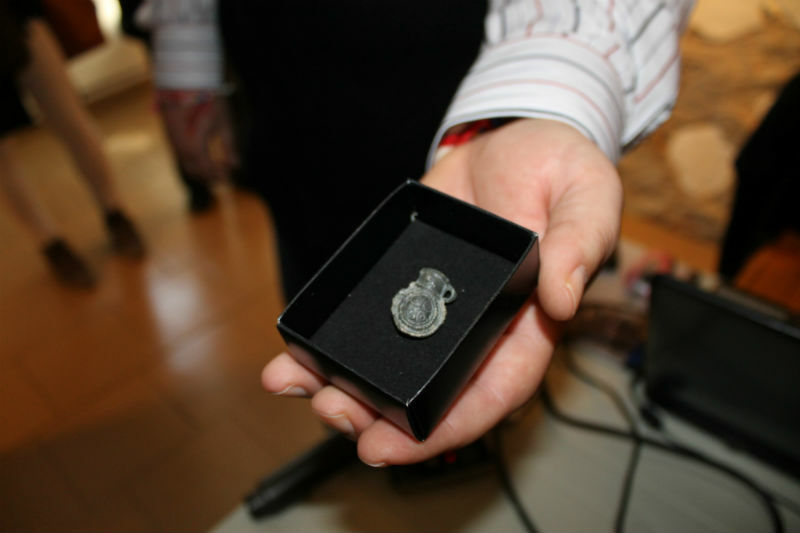 “Probably a pilgrim from the Foros Peninsula (Cape) went on a pilgrimage to Ephesus, and came back here with this relic which was then donated to the basilica on Foros,” Nikolov has explained, as cited by local news site Gramofona. Nikolov has described the finding of the reliquary as “one of the most important discoveries in the history of the [Burgas Regional History] Museum”, and the lead tube as a “holy possession that preserved a holy substance” having to do with the beliefs that every year on May 8, the date of John the Apostle’s death, there is manna, a holy curing powder, on the site of his grave. The lead tube reliquary itself containing the ashes from the grave of John the Apostle (St. John the Theologian) is really tiny: it is only 2.2 cm (less than an inch) long, and its diameter measures 1.7 cm. The reliquary is dated to the 6th century AD when pilgrimage to the Holy Lands was very common among Christians, Nikolov explains. On one of its sides there is an image of a cross with equal arms inside a medallion, and on the opposite side there is an image of two overlapping crosses with equal arms. The neck of the tube is also decorated with crosses. It has only one handle left, the other has broken off. In addition to the so called Empty Tomb, i.e. the Tomb of Jesus Christ in Jerusalem, the other centers of Christian pilgrimage in the 6th century AD included the grave of St. Menas in Abu Mina in Egypt; the grave of St. Simeon Stylites the Elder in Antioch (in today’s Turkey); the grave of St. Thecla (or Tecla) in Seleucia, Mesopotamia; the grave of St. Isidore of Chios on the Aegean island of Chios; and the graves of John the Apostle (St. John the Theologian), St. Mary Magdalene, and St. Timothy in Ephesus. 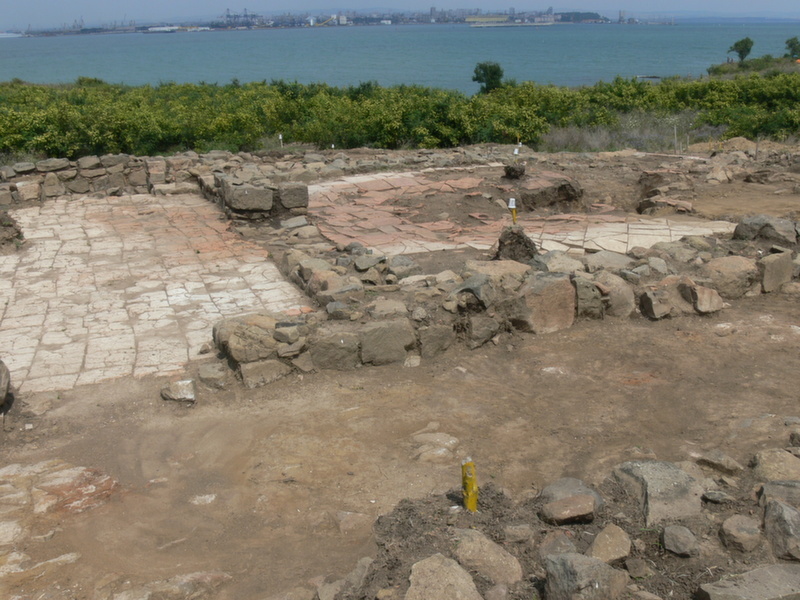 All of these Early Christian pilgrimage centers produced primarily clay tubes for holy water; a total of only 43 lead tubes from this time period are known in the entire world, the Bulgarian archaeologists from the Burgas Museum point out. They explaining 20 of those known lead tubes have been found in the St. John the Baptist Basilica in Monza, Italy (the Monza Cathedral); they were a gift from Lombard Queen Theodelinda (c. 570-628) made at the beginning of the 6th century. Another 16 lead tubes have been found in a grave in the Bobbio Abbey (a monastery founded by Irish Saint Columbanus in 614 AD) in the Italian town of Bobbio, close to Milan. One lead tube reliquary has been discovered in the Sant Pere de Casserres Abbey, a Benedictine monastery in the town of Les Masies de Roda, Osona comarca, Catalonia, Spain. In addition to these lead tube reliquaries, three others are kept in Germany and four in the USA, all of which were produced in Jerusalem and have depictions of Gospel scenes. Even though the reliquary discovered by the Bulgarian archaeologists in the basilica in the ancient and medieval fortress Burgos (Poros) on Cape Foros is also a lead tube, it is different from the other known lead tube reliquaries because the images on it are identical with the images from a group of clay tube reliquaries produced in ancient Ephesus. “That is why at this stage we believe that the Burgas reliquary comes from this pilgrimage center (i.e. Ephesus) and it must be connected with the cult for St. John the Theologian (John the Apostle),” the head of the Burgas Museum of History, Milen Nikolov, explains. He also notes that John the Apostle was particularly cherished by the Early Christians. According to the Bible, John was Jesus Christ’s favorite disciple, and when Jesus was crucified he asked John to take care of the Holy Mother, Virgin Mary. Later, John the Apostle settled in the ancient city of Ephesus together with Virgin Mary and St. Mary Magdalene. This is where he wrote the Book of Revelation, also known as The Apocalypse, and lived till the rest of his life. According to some historical sources, Christian pilgrims from around the world would gather on his grave in the Ephesus basilica on May 8, the date of his death. They would sprinkle rose petals on the rock above the basilica, and the next day wonder-working powder would appear on the rock. This manna could cure all kinds of diseases, which is why it was collected by the pilgrims in reliquaries and taken to their places of origin as evidence of their pilgrimage or as an apotropeus (an apotropaic item, i.e. an amulet chasing away evil). Some scholars believe the manna collected by the pilgrims came from the pollen from the roses they placed on John the Apostle’s grave in Ephesus. “That is why, at this point, we believe that a pilgrim from the fortress of Poros went on a pilgrimage to the grave of St. John the Theologian in Ephesus from where he brought the valuable reliquary with curing powder,” Nikolov elaborates.